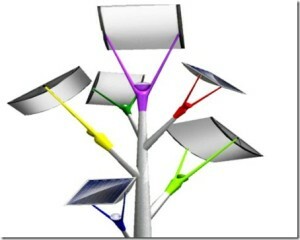 Solar Trees During the Day Illuminate the Night. Tradesmen On Time are always interested in upcoming technology. This one is a cracker. Eco Factor: Solar-powered streetlight concept. 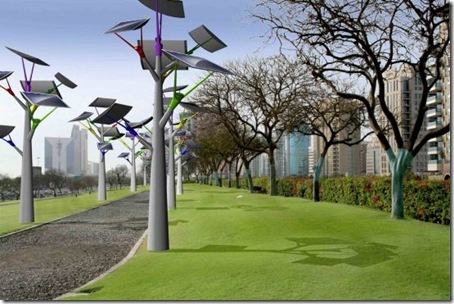 Fusing nature and technology, designers over at Vinaccia Integral Design have conceptualized the Solar Tree – an innovative street lighting system that gets powered by renewable solar energy. 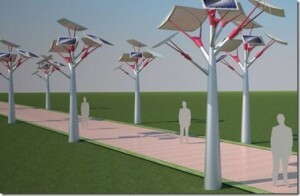 The Solar Trees are a tribute to the energy and beauty of Mother Nature. The tree-shaped structures have six branches, each of which is equipped with monocrystalline silicon solar cells that generate up to 100W of clean electrical power. Since the panels are mounted at different angles, they help in generating a constant energy output. The electricity generated by the system is stored in onboard battery packs that can power the streetlight for up to four days without sun exposure. The “trunk” of these solar trees is crafted from lightweight aluminum and is painted in different range of colors to suit the environment. 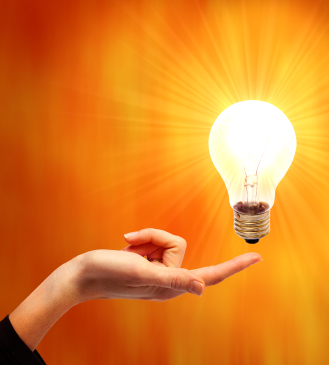 The energy is supplied to a 48W LED lamp that has brightness equaling an ordinary 400W halogen lamp.